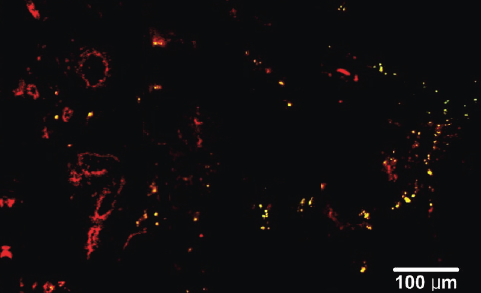 Image of Nanopartz GNR labeled cell subsequently labeled with the live cell dye Calcein-AM, shown in red. From Motamedi 2011 BOE (2)5. NCBI Copyright Approval. 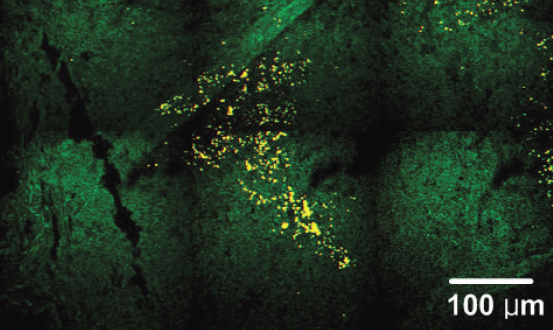 Two Photon Image of Nanopartz GNR labeled cells using an incident power of 0.7mW overlayed with corresponding transmitted light micrograph. From Motmaedi 2011 BOE(2)5. NCBI Copyright Approved. 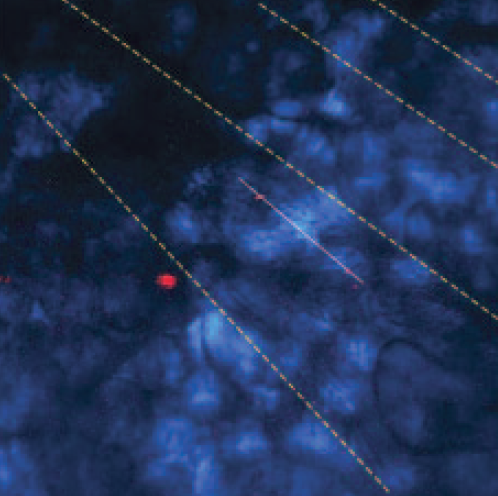 Two photon image using low incident power of 1mW following intravenous injection of Nanopartz gold nanorods in Hamster Model showing blood vessels in the tissue. From Motamedi 2011 BOE (2) 5. NCBI Copyright Approved. White light microscopy images of control tumor and GNS and Nanopartz Ntracker GNR injected mice. 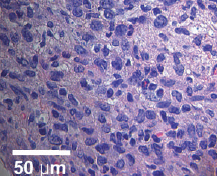 (Pink: cytoplasm stained with eosin, Dark Blue: nuclei stained with hematoxylin). From Park, Lasers Surg Med. 2010 September 42(7) 630. NCBI Copyright Approved. TPIP images of Tumor model (Green: cytoplasm stained with eosin, Yellow: GNSs and Nanopartz Ntracker gold nanorods). From Park, Lasers Surg Med. 2010 September 42(7) 630. NCBI Copyright Approved. 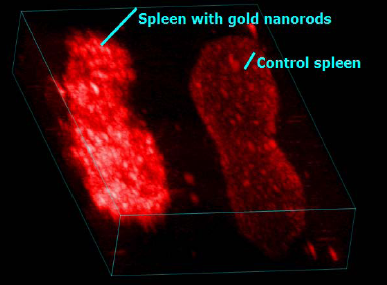 TPIP images of Nanopartz gold nanorod injected mice with nuclei staning (YOYO-1 iodide). Two photon IP image with FOV of 720x490um measured at the distance of approximately 100um inside the tumor edge. 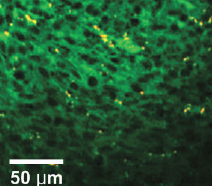 (Green: nuclei, Yellow: Nanopartz Ntracker gold nanorods). From Park, Lasers Surg Med. 2010 September 42(7) 630. NCBI Copyright Approved. Two Photon IP images of Nanopartz gold nanorod injected mice with blood vessel staining (CD31 immunofluorescence staining). TPIP image with FOV of 790x520um. Red: blood vessels, Yellow: Nanopartz Ntracker Gold Nanorods. From Park, Lasers Surg Med. 2010 September 42(7) 630. NCBI Copyright Approved. Two Photon IP images of liver of Nanopartz Ntracker gold nanorod injected mice. From Park, Lasers Surg Med. 2010 September 42(7) 630. NCBI Copyright Approved. 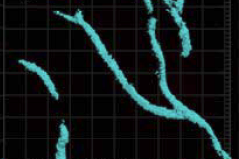 In vivo imaging of single gold nanorods in mice ear blood vessels. Overlay of transmission image (light blue) and a single frame TPL image. 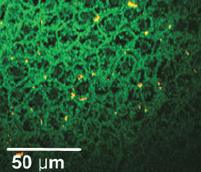 Two single nanorods (red spots) are superimposed by a linescan (white). From Wei Nanomedicine (Lond). 2007 February 2(1) 125-132. NCBI Copyright Approval. 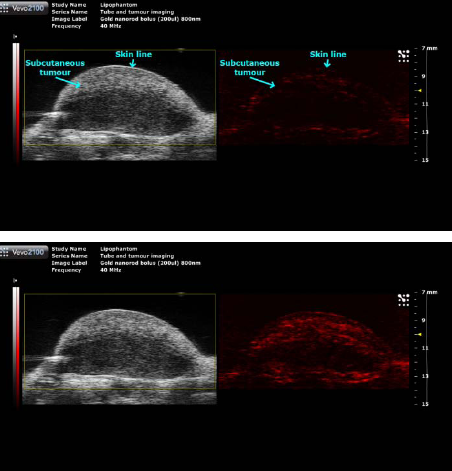 Gold nanorod contrast enhanced Optical Coherence Tomography images of a human breast carcinoma tissue sample. The sturcutral OCT image is presented in red, and the SOCT computed GNR density is presented in green. Nanopartz™ gold nanoparticles for in vivo application include both the Ntracker™ and Ntherapy™ family of nanorods, along with customer defined oligo and antibody conjugated nanrods for in vivo applications. The Ntracker™ non reactive methyl terminated nanorods are coated in a proprietary dense layer of hydrophilic polymers that shield the gold surface and give the particles ultra-long circulation times. Ntherapy™ nanorods come with similar hydrophilic polymers, but with terminal amine and carboxyl active groups, along with a number of custom popular in vivo targeting ligands. Ntherapy™ also provides an opportunity for the customer to define their own targeting ligands utilizing Nanopartz™ nanorod and polymer technologies. In this family, Nanopartz™ has the ability to covalently conjugate to specific antibody locations, thereby for example, leaving necessary primary amines exposed for optimum activity. The combination of the highly monodisperse Nanopartz™ gold nanorods with the proprietary Nanopartz™ polymers increase circulation times 50% longer than other commercial polymers thereby significantly improving targeting. As opposed to other commercially available nanoparticles such as quantum dots, Nanopartz™ in vivo line of nanorods are completely non-toxic. Whereas Ntracker™ takes advantage of the Enhanced Permeability and Retention effect (EPR) for passive in vivo targeting, Ntherapy™ utilizes popular ligands for active targeting. This product line comes in a diameter of 10nm with SPRs matching all of the popular Near IR CW laser wavelengths; 780, 808, 850, 980, and 1064nm. Ntherapy™ offers options for oligo and customer detailed conjugations. Every batch is radiation sterilized in PBS, and comes with instructions for in vivo mouse iv injection. A Certificate of Analysis (COA) is provided for every order exhibiting TEM and UV-VIS images and data, as well as DLS data. Every product is in stock (99%) and is shipped next day for many ligands. This product comes in two concentrations, regular 1.75mg/mL, and highly concentrated 10mg/mL. Nanopartz™ In Vivo Plasmonic Fluorophores™ are fluorophore decorated gold nanorods manufactured using multiple patent pending and proprietary methods that result in fluorophores that exhibit much higher intensities than conventional fluorophores, no photobleaching even under the highest laser intensities, with long circulation times in vivo. Peak fluorescence range from 780 to 1064nm utilizing the same nanorods and in vivo polymer used in our Ntracker and Ntherapy products. NOTE: These products are for Research Use Only. Not for use with Humans. Part# D12R-(SPR)-(Ligand)-(Wt. conc); This product is for quotation only. Functionalized gold nanoparticle with Nanopartz™ Ntherapy covalently bonded polymer. Thickness of polymer is less than the size variablity of the gold nanoparticle. multiple DNA oligonucleotides from gold nanorods, ACS Nano 3 (1) (2008) 80–86. These polymer coated gold nanorods are shipped in PBS with no measurable residual chemicals. This product is radiation sterilized and is ready for injection. Popular CW laser wavelengths are available (780, 808, 850, 980, and 1064nm). Other sizes are special order. Please contact us. This product is available in 1mL and larger but in two different concentrations. The lower concentration is suited for mice, while the higher concentration is suitable for companion animals. For mice, the 1mL injection is suited for 5 injections. For orders larger than 1L, or for orders amounting over 10L per annum, please contact sales for quantity pricing. Standard sizes are in stock. Special order sizes are shipped in two weeks or less. All domestic shipments are sent Fed Ex Standard Overnight delivery, international Fed Ex Priority 2 day. No shipments on Fridays. This product comes coated with a proprietary polymer to increase circulation times. Ntracker™ contains a non-reactive methyl termination. Ntherapy™ contains many choices for reactive terminations. Many popular in vivo conjugations are available. These products are non cytotoxic. Ntracker™ is based on extensive research in laboratory, preclinical, toxicology, and more recently clinical trials. The technology is based on patented, patent pending, and proprietary methods. Nanopartz™ has the capacity for up to 1kg of Ntracker™product per day in its audited ISO 9000 facility. Ntherapy™ offers the same technology as Ntracker™ with the added advantage of popular in vivo conjugations and customer specified oligo and antibody choices. This product has been extensively tested in mice and companion animals. VisualSonics is the world leader in real-time, in vivo, high-resolution, micro-imaging systems, providing modalities specifically designed for preclinical research. VisualSonics has commercialized Vevo LAZR Technology, a state-of-the-art photoacoustic imaging system with inherent coregistration and capabilities for imaging gold nanorods in vivo. "Listen to the Light" - Photoacoustic imaging with the new Vevo LAZR System. Gold nanorods for ovarian cancer detection with photoacoustic imaging and resection guidance via Raman imaging in living mice. In vivo photoacoustic molecular imaging with simultaneous multiple selective targeting using antibody-conjugated gold nanorods. "We have looked at many different gold nanoparticles samples from Nanopartz including spheres, rods, and microrods using single particle spectroscopy techniques and are extremely happy with the quality of the samples and the service provided by Nanopartz." 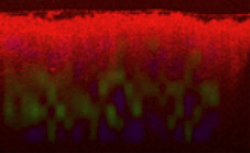 ... of the retina in vivo, which is a crucial step toward OCT-based molecular imaging in the eye. 2.
detected ex vivo by atomic absorption methods, and in vivo by CT imaging . ... Methods. Materials.